Order your Boss VE2 Vocal Harmonist Pedal from AMS and enjoy 0% Interest Payment Plans, Free Shipping, Free Extended Warranty & 45 Day Money Back Guarantee. 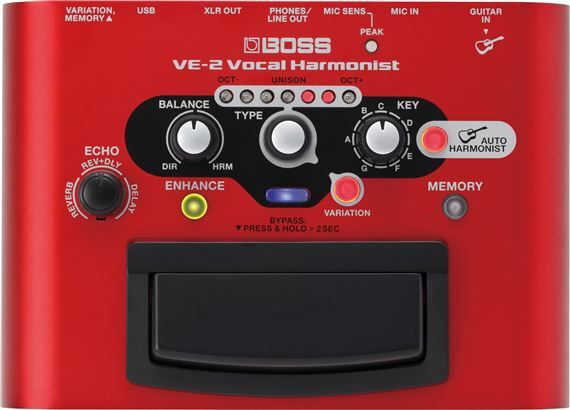 The VE-2 Vocal Harmonist from Boss combines incredible sound capabilities, simple operation and a feature set that makes it ideal for all singers, particularly those that perform with guitar! Create polished, studio-quality sounds everywhere you sing thanks to its portable, battery powered design. From concert stages and street performances to practicing and having fun at home, the VE-2 covers it all! When you connect your guitar to the Boss VE-2 pedal, the Auto Harmony function detects the chords and key you play and automatically generates the correct harmony as you sing—it’s that easy! If you don’t play guitar, you can have the guitarist in your group plug in instead, or set the song’s key manually with a panel knob. Hybrid mode provides the best of both worlds, following both the guitar chord progression and the current manual setting. 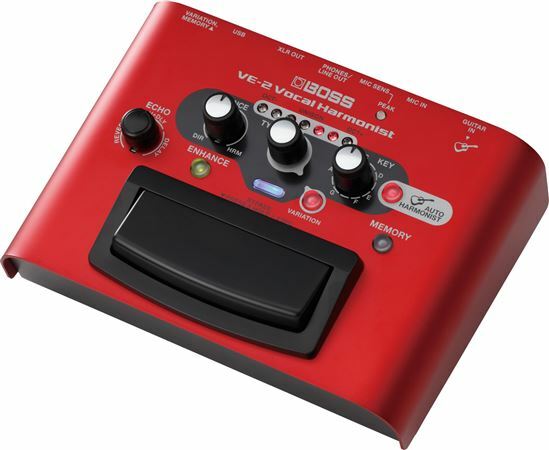 This is ideal for times when you’re riffing on your axe and singing at the same time - when the guitar chords drop out, the VE-2’s manual setting instantly takes over. With these three intuitive methods, you’re able to achieve natural, stable harmonies without any knowledge of electronic gear or music theory whatsoever. The VE-2 is incredibly intuitive for anyone to use, even for vocalists that have no previous experience with sound equipment. Buttons and knob-based controls make it simple to get great sounds instantly, while the handy LED indicators show the current vocal harmony setting at a glance. The integrated multi-function footswitch allows you to turn harmony on/off or bypass the VE-2’s sound entirely as you perform, and you can even connect up to two optional footswitches for more control if desired. In addition, you can save three favorite sounds in onboard memories and recall them at the touch of button. You don’t have to rely on a sound engineer any more to make your vocals sound great—everything you need is included in the VE-2. The Echo section provides high-quality reverb, delay, or a mix of both, all intuitively adjustable with a dedicated knob. Pressing the Enhance button once evens out your vocals for a more refined, studio-type sound, while a second press adds in some subtle pitch correction for stable harmony. The XLR input accepts a variety of professional microphone types, including studio-level condenser mics that require phantom power to operate. Phantom power is even available when the VE-2 is operated on batteries, letting you use these high-quality mic types everywhere you perform. Normally, recording your singing along with real-time harmonies and sound enhancement requires a complicated setup with multiple devices. Not so with the VE-2! Just connect to your computer with a USB cable and use your favorite recording software to capture your voice with harmonies and effects. In addition to music production and songwriting applications, this also gives singers a simple way to achieve impressive vocal sounds while recording performances for social media videos. With the VE-2’s Loopback function, you can mix audio playback from your computer with the mic sound, allowing you to easily record sing-alongs with backing tracks and karaoke tunes. I've been waiting for something like this for a long time! Being mostly a solo acoustic musician for many, many years, I have always been looking at technology that would enhance the vocal aspect of my performances. Mainly, I was looking for something to add harmonies to some of the songs I play. I wasn't expecting the Boss VE 2 to be what it turned out to be! From the sensativity and tracking of the harmonies to my voice, to the great built in effects, to the sheer ease of use of this unit. I think it is a fantastic addition to what I do, and would be for anyone that wishes to add that little something extra to their vocal performance, or even to just sit around with a mic and headphones and goof with it. 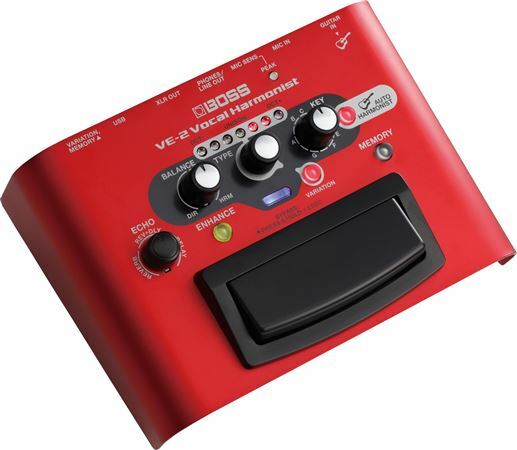 I highly recommend the Boss VE 2!